The hepatitis A IgM test checks the hepatitis A IgM antibody level. What is this hepatitis A IgM test? This hepatitis A IgM test measures the hepatitis A IgM antibody blood level. Why is the hepatitis A IgM antibody test important? The hepatitis A IgM test checks for a current or recent hepatitis A infection. This Hepatitis A IgM Test is a blood test. The hepatitis A IgM test, also known as the hepatitis A IgM antibody test, measures the hep A IgM antibody blood level. Hepatitis A, or Hep A, IgM antibodies represent a special class of proteins produced by the immune system. Also known a Hep A immunoglobulin M, Hep A IgM antibodies typically present earlier than other types of antibodies in identifying a new hepatitis A infection. However, a single hepatitis A IgM antibody measurement in isolation is not as accurate as to one's clinical state as when this blood test is ordered with the hep A total antibody test which, together, make up the commonly ordered hepatitis A test panel. To get a hepatitis A IgM test near you, just order online and get tested at the selected Quest Diagnostics lab. Once the hep A IgM lab results are ready, they will be available for download. As can be seen on the hep A IgM lab report, the hepatitis A IgM blood level will be reported as non-reactive if no hepatitis A IgM antibodies are detected by the lab. 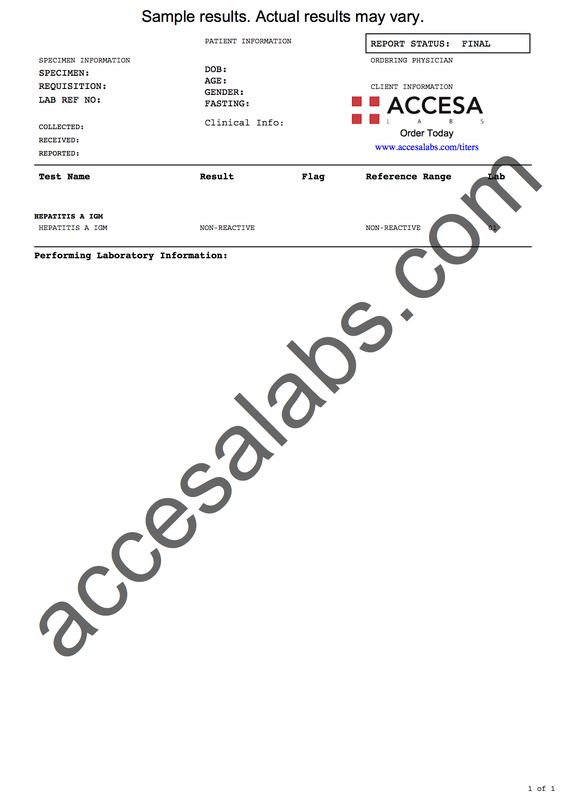 The hepatitis A IgM antibody lab test is sometimes ordered with the Tdap titer and the polio titer. Hepatitis A IgM Test at Guaranteed Prices.